Sri Krishna Janmashtami is the appearance anniversary of Krishna, the Supreme Person. He's not "born" like we are—He comes and goes as He likes—but He appears here to please His devotees, rid the earth of evildoers, and give the rest of us something worthwhile to talk about. His pastime of janma, birth, occurred on the ashtami, eighth day of the waning moon in the lunar month of Hrishikesh. Janmashtami is one of the world's biggest spiritual festivals, and is observed by followers of many faiths. For Krishna devotees, Janmashtami is a day of non-stop chanting, cooking, worship of Krishna in His Deity form, and fasting until midnight, when a grand feast is served. The Tenth Canto of the Srimad-Bhagavatam describes the events leading up to and including Krishna's appearance on earth. 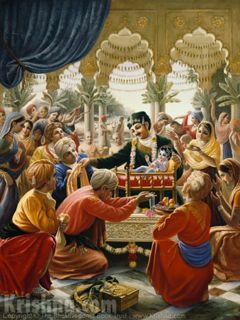 Srila Prabhupada encouraged his disciples to read about Krishna's pastimes in the Bhagavatam, cook a feast for Krishna's pleasure, and chant Hare Krishna all day and into the night each year on Janmashtami. 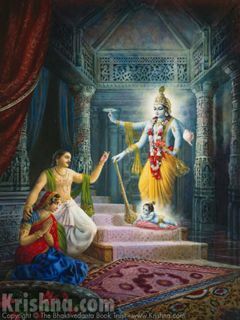 Painting at left shows Krishna appearing within Vasudeva and Devaki's prison cell. At right is Krishna's father Nanda celebrating his divine Son's birthday.